Hop over to Julz Reads to link up your introductory post! So far this year, I’ve read 35 Nonfiction books (37% of my total books read), 27 of which were audiobooks. Audiobooks seem to have almost single-handedly (well, 77%) saved my nonfiction reading this year! Most of my nonfiction reading this year has been memoirs or essays with some investigative journalism, sports books, and life improvement thrown in. Narrative Nonfiction, which is my favorite type of nonfiction! And, the reason I haven’t read much of it this year is that narrative nonfiction doesn’t work quite as well for me on audio as other types of lighter nonfiction. And, so much of my nonfiction reading so far this year has been on audio. Start making my Nonfiction TBR for 2018! I listened to the Anna Quinlan book a couple years ago and really liked it. My favorite nonfiction so far this year is The Bright Hour. I just finished listening to Oprah’s new book The Wisdom of Sundays and I loved it. I tend to listen to nonfiction more than read it which usually works out for the most part. Wow! You really have read a lot of nonfiction. It’s my biggest nonfiction year ever, but that’s not really saying much. Looking forward to this month and hearing about some wonderful nonfiction options. I love narrative nonfiction too and don’t read enough of it. 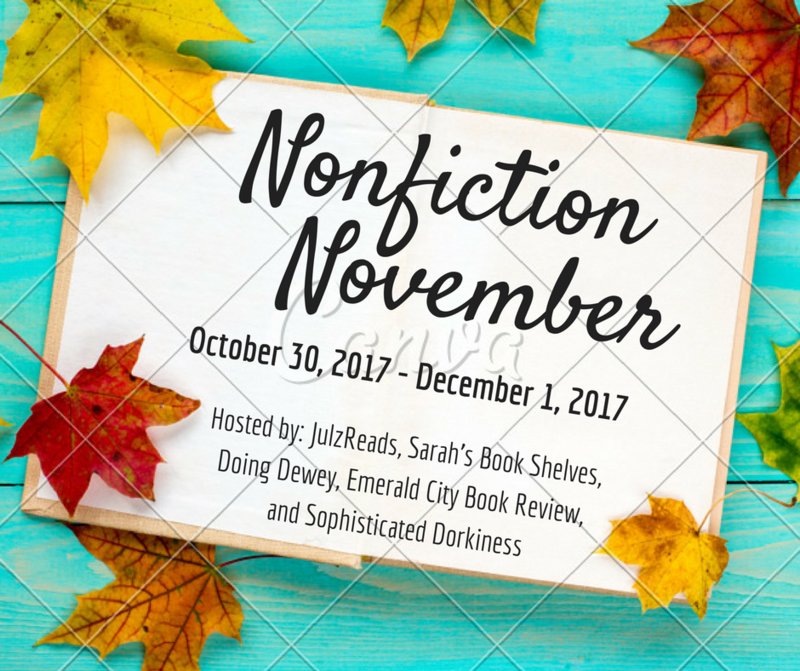 Non-fiction November! Very cool idea! My best so far this year were: Daring to Drive, Born A Crime and Reading with Patrick. Looking forward to hearing everyone’s best! Happy Holidays and Happy Reading!! Wow, you have read so much nonfiction! 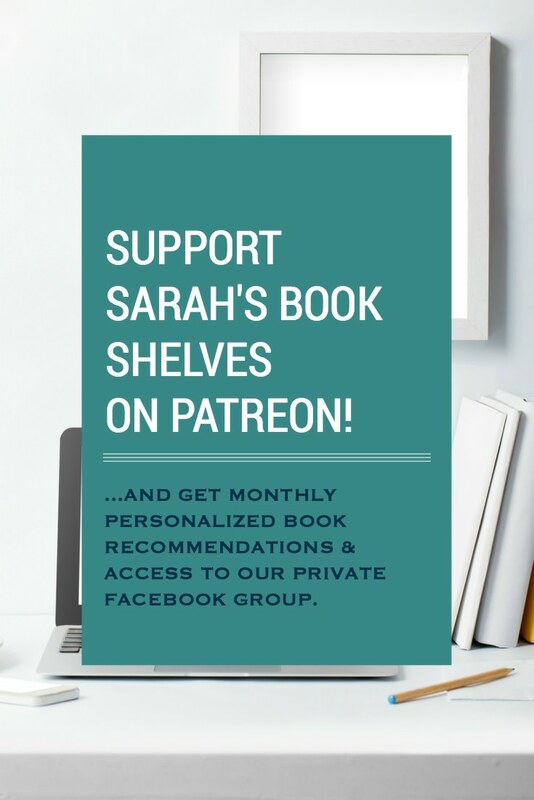 I feel like I’m going to get a lot of new additions to my TBR from you! You have read so much non-fiction this year! That Trevor Noah book was so much more than I expected it to be. So excited to get to binge on non-fiction for a whole month! Both your most recommended are sat on my Kindle already! The Finkel book is popping on a few lists this year – intriguing – it’s obviously not the Eat Pray Love of the hermit world that I thought it was going to be! I loved Born a Crime, too–and now have The Stranger in the Woods on my to-read pile! Yea for narrative nonfiction! Have you read Ghettoside by Jill Leovy? It’s part police procedural, part court drama, and part whodunit – it kept me riveted. I LOVED Ghettoside! So glad to here somebody else did! It is so much fun to see other lists on great non-fiction. Trevor Noah’s book keeps popping up…is it that good? 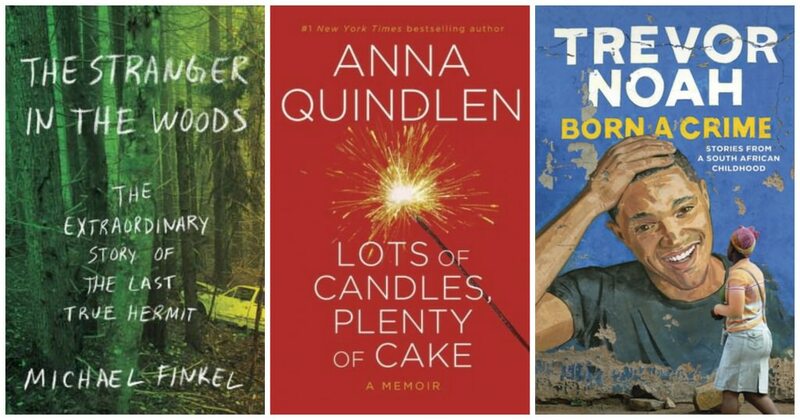 Also your ‘best’ audio books by M.Finkel and Anna Quindlen, I would never have considered them, but now on my TBR list! Wow! That is a lot of nonfiction to read in one year! Make my ‘7’ look pretty pitiful! I don’t listen to many audiobooks, and when I do, they have to be fast-paced fiction. I’m afraid if I tried to listen to nonfiction, I’d be constantly rewinding! I thoroughly enjoyed Born a Crime. Another outstanding nonfiction book is Al Franken’s Giant of the Senate. I’m hit and miss for narrative nonfiction on audio too. There’s some that really, really works — Into Thin Air by Jon Krakauer is stellar on audio — but other stuff can be hard to follow when it shifts back and forth between story and information. That’s so funny – I did love Into Thin Air on audio! It was one of the first audios I ever listened to…on CD! Haha! I’ve heard really good things about The Stranger in the Woods … I think I need to check it out. I hope you can get more narrative nonfiction in your reading! Born a Crime is definitely going on my TBR for next year. I feel as though I missed out on narrative nonfiction this year too. Hi Sarah! It’s been a while. I figured Nonfiction November was a good time to jump back in! As always I haven’t read much nonfiction, but, as always, there are many I would *like* to read. And I always love adding to my list! Well hello!! It’s so hard to fit in nonfiction! If it wasn’t for audio, I would barely have read any this year until this month! Hope you get some in. I should definitely get to Born a Crime! It sounds fascinating.